Based on the autumnal French tradition of Martinmas, last week we enjoyed a very special lantern walk of our own at Hugo's school. There was much excitement on the evening when we met at Hugo's class at dusk, which was beautifully decorated with glowing jack o' lanterns. The peeps hung their lanterns on pegs and went inside for songs and a puppet show by candlelight. Afterwards we went back outside to light our lanterns and made an illuminating procession through the school with more jack o' lanterns lighting the way, down to a bonfire. 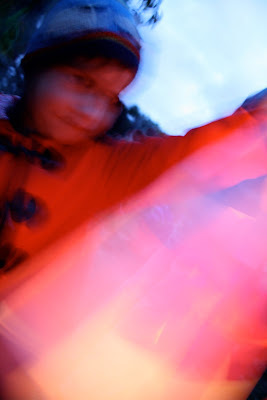 In the gloaming we made a large circle of glimmering lanterns and sang songs around a beautiful bonfire. Lantern walks are popular with young children who are keen to see the dark autumn evenings brightened. Hugo thought it was magical and it was a treat for me to celebrate a traditional festival in the appropriate season. As the days become shorter, it brings about a feeling of cherishing the light in preparation for the coming darkness of winter. A very magical and wondrous festival. Always my favourite thing from Audrey's time at Silvereye :) Looks like you had a beautiful time! We've continued the tradition here because its just so lovely. We do it to mark the weather turning colder and needing the fire on more often! That sounds beautiful. I was just thinking last night I should really carve a pumpkin some time soon while they're in season. It's such a North American autumn thing to do. But it feels very out of place in October/November in Australia. Love the pics. xo m.
hi there! love your blog, i live in the country to, but on the other side: Chile! Hello Michelle, I just loved this post. I am fairly new to blogging and wanted to introduce myself and let you know I have listed you on my blog list. Your beautiful photos have me stopping by to view 'hugo and elsa' often. I hope it is Ok that I have used some of your photos in a recent post. I have given you the credit and a link back to your blog.